For several months, I’ve been pricing replacements for our elderly, failing, nightmare-to-clean Jenn-Air range. Few retailers carry what I wanted — a 30-inch range with a downdraft vent — and it was going to make a big hole in my budget: the lowest price I found was $1,899.00, and a model comparable to the one I was replacing would cost me, before sales tax, $2,368.00. About six weeks ago, I had occasion to visit the Cleveland Habitat for Humanity ReStore on West 110 Street (map), and I wandered into their major appliances department. 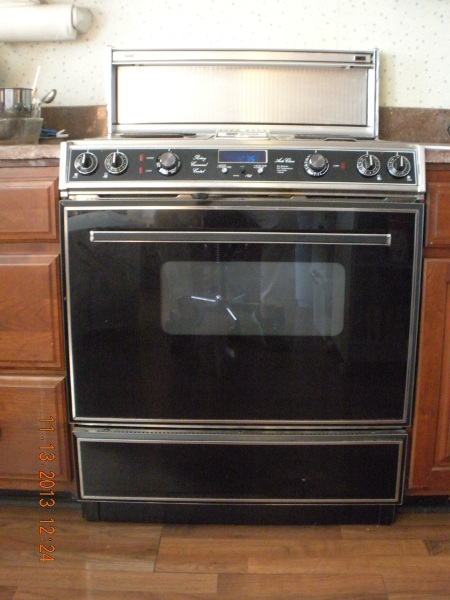 There it was: a Jenn-Air range, slightly newer than ours, sparkling clean, missing only the oven control knobs and the knob for setting the clock, and priced at $350.00. The store was about to close and the event that had brought me there was about to begin, so I swallowed hard and walked away from my delightful find. Conversation with an employee during the event assured me that their appliances are in working order and that they could be returned for a refund if they fail to perform as advertised. The following day, my husband and I went to the store, where I purchased the range (for $378, including tax) — only to find that it wouldn’t fit into the trunk of my husband’s car. But ReStore would hold it for me for two days, and our son-in-law offered us the use of his Pontiac Torrent and its 35.2 cubic feet of cargo space. Two days later, we were back at the ReStore, where a group of employees jockeyed the stove into the Torrent and sent us on our happy way. Over the following weekend, my husband and his son disconnected the old range, moved it to the Torrent, adjusted the vent system to fit the new range, hooked it up, and plugged everything in. From the old range, I saved the oven racks and the grates that had covered the grill unit (these make great cooling racks). On Monday we took the remains to a scrap dealer, who calculated the scrap value and handed me cash that just covered a celebratory breakfast and a respectable tip for the waitress. New knobs for the oven controls and the clock (available from Sears Parts Direct) added $66.03 to the price of the range, and the stovetop enjoyed a little detailed cleaning. When I was finished, we had an almost-new Jenn-Air range with downdraft vent and 21-inch oven for about 18% of what a new one would have cost us. Habitat for Humanity and I saved a perfectly good appliance from the landfill, the materials in our old range will be recycled, I saved $2,113.41, and we now enjoy cooking on a stove on which everything works and which cleans up easily. This entry was posted in Shop Recycled and tagged Habitat for Humanity, Habitat for Humanity ReStore, shop recycled. Bookmark the permalink. Thanks so Much !!! Have a Great Day ! !